NIA-CHARLESTOWN NEVIS (March 16, 2011) — Guidance Counsellors on Nevis have been playing an active part in the fight against crime on the island, a matter which was pointed out by representative of the Nevis School Counsellors Alliance Mrs. Shobaina Clarke Prince. 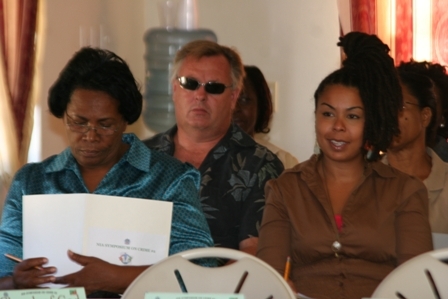 That position as made clear at the second Symposium on Crime hosted by the Premier’s Ministry in the Nevis Island Administration on March 10, 2011. It was held under the theme “Reclaiming our Society” at the Red Cross Building in Charlestown. During her presentation she said there had been an apparent increase in good behaviour. “Presently there seems to be an increase in good behaviour and I say this based on a report by the Truancy Officer who normally visits the school. I had a discussion with one of them and she told me that she has realised that there has been a decrease in the amount of reported incidence in the schools as they do their visits,” she said. The change in behaviour was attributed to increased awareness of negative behaviour among students which in turn led to decreases in bad behaviour. Mrs. Clarke Prince explained that the Guidance Counsellors sought to address the basic psychological needs of the students which included survival, security, a sense of belonging, self esteem and self determination. “This in itself helps to ensure that deviant tendencies are identified earlier so that the amount of crime in our community can be decreased,” she said. According to the Nevis School Counsellors Alliance Representative, Counsellors have had to participate in crisis intervention strategies and came together to provide moral support and addressed many school issues in the area of stress, depression, suicide and self harm. The community, it was noted, played a vital role in the upbringing of a child and therefore was very involved in the teaching process. “Many professionals in the community have been asked to share their experiences on various topics in the classroom such as health, diet, exercise, puberty and relaxation techniques because sometimes all we need is to relax,” she said. The Counsellors have also participated in community outreach projects with students which included the distribution of gift baskets compiled and made by students to the elderly in their surrounding communities. That project Mrs. Clarke Prince said helped the students to develop sensitivity and compassion. They have also engaged in home visits not because of deviant behaviour but also to lend support and encouragement to parents when students were ill. While she listed other initiatives, Mrs. Clarke Prince said every counsellor had the opportunity to interact with every student in the school through a programme called Values, individual counselling and focus groups. “Values is a programme that is taught to each class as a group from Kindergarten to Grade 6 and every student benefits. Lessons in Values includes but is not limited to conflict resolution, anger management, self esteem, self worth and self control. “These sessions teach the students to be responsible for themselves and their actions. They also allow for the use of positive reinforcement techniques such as rewards and consequence models. Many programmes have been implemented to target particular classes and to also help the schools while using a holistic approach,” she said. The Counsellor further pointed to the use of a Behaviour Modification Plan which is based on the Individualised Educational Plan (EPA) which involved collaboration of class teachers, principals, parents and counsellors. The programme led to individual counselling for students who were at risk for deviant behaviour or who needed assistance in the development of self control and self confidence. Also in place was the Jolly Healthy Club programme geared towards children 5-7 from Kindergarten to Grade 2. 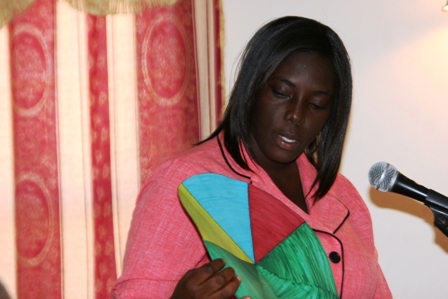 The programme, Mrs. Clarke Prince explained, was one of life skills and drug prevention through the use of creative play methods. “This consists of 12 sessions that encourage children to take an active role in keeping themselves safe. It seeks to develop children’s communication and decision making skills which promotes self esteem and confidence. It encourages children to explore their own behaviour and attitudes and promoted a healthy lifestyle,” she said. There was also the implementation of a Colour Wheel which would determine the percentage of children who were on good behaviour and those who fell short in varying degrees. Those were represented by four colours – green, yellow, blue and red. Every morning the classrooms started off with each student on green under the assumption that all the students had desirous behaviour. They would be placed in the various colour slots on the chart in accordance with their behaviour. Then was blue, which stood for abusive language, lying, littering, disobedience, unsafe practices, fighting, undone homework, disrespecting teachers and adults, continuous disruptive behaviour, defacing or damaging school property. The consequence of being in that section were lines, counselling, cleaning the area, work to be done during lunch time, no recess and quiet time. Red included stealing, abusive language and sadly weapons. The consequences were detention and counselling. The programme also offered rewards for consistent good behaviour. “Some of the rewards for being on green daily, you receive stars on your chart, stamps and reward tags. Weekly, you have a free choice activity for 10-15 minutes only given to students who have three to five stars per week. If you have three to 10 stars you receive five to 10 extra minutes and Monthly on the last Friday afternoon which is also Dress Up Day, it’s a special day, only given to students who have 15 or more stars you will have a movie. “So those are for the children who we will assume are on target so they would be on green and have a special movie and this encourages the student to always be model students in school,” she said.